I'm glad you're here! Click on my picture to learn more about me. I hope you enjoy navigating through my six years of art lessons! Parrots are an art room staple..for lessons, I mean. They are easy to draw and even more fun to paint. I love this lesson because, no matter what the child's perceived artistic ability, most will be totally surprised with how well they did. For this lesson, which took three-45 minute class times, we started with learning how to draw a basic parrot. I use the "shape" strategy. Draw a circle for the eye, draw an arrow for the beak, etc. Most kids find it easy to draw when a confusing and seemingly difficult image is broken down into basic shapes. After the kids draw a parrot on scrap paper, I give them a large sheet of white 12 x 18 sulphite paper. They are free to draw whatever bird they like. I plaster the white board with pictures of tropical birds and give them black and white drawings of birds, used as a drawing aid, for their table. I encourage the kids to use a black marker for drawing. Pencil and erasures take up too much class time. Most kids will spend the entire class period erasing their lines. By the second class, each kid will have a completed bird drawing. At this point, I give them a tray with the primary paint colors on it. We go over how to mix the colors to make the secondary colors and then the kids are free to paint their tropical birds. By the last class, some kids need to finish their painting but all others can add a black marker detail to their painting. Outlining the leaves, feathers and other details really make the painting come alive! Thank you so much for your lessons. Are you coming to national conference? I would love to meet you and thank you in person. You sound like my students! That's the first question they ask me when I tell them we aren't working with pencil. I hate to say this, but it really comes down to how you teach kids how to draw; how to look at shapes, to understand that when a line is drawn they don't like, they can turn it into something else. That's why drawing birds or parrots with a marker is easy. Turning "mistakes" nto feathers or stripes can not only be fun, but freeing. Try to impose a sense of no-judgment into your students. Many times, those mistakes give a drawing character. Good luck and remember that kids learn most through mistakes. NEW! 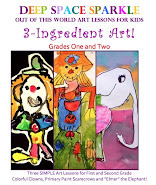 "3-INGREDIENT ART: LESSONS FOR GRADES THREE & FOUR. 24-PAGE BOOKLET FOR DOWNLOAD. ONLY $5. Features 3 simple lessons using 3 basic products: paint, paper and coloring medium. Teacher tips and drawing aids included. Features 3 simple lessons using 3 basic products: paint, paper and coloring medium. Teacher tips and drawing handouts included. Featuring art from Russia and Mexico, these three lessons can be adapted to most elementary grades. Simple materials. Easy Instructions. This booklet features three animal art projects: Dancing Cow, Speckled Hen and Close-up Giraffe Portrait. Using simple materials, all of these lessons can be completed in an hour or less. 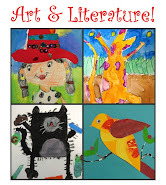 "Art & Literature" Lesson Plan. 33-Page PDF Booklet. Only $5! Four art lessons inspired by children's literature. "Splat the Cat", "Pie in the Sky", "Saturday Night at the Dinosaur Stomp" and "Do You Have a Hat?" Click on the picture for more info. Three super easy, yet stunning, lessons (Russian Architecture, Folk Art City and Crazy Critters) that feature a black marker and white paper! Add color as an option. Three impressive lessons (Barns, Castles and Victorian homes) for upper elementary students. Click on the picture to return to the original post. Four dynamic drawing and watercolor lessons (Bird, Frog, Tropical Fish & Clipper Ship) for elementary school children. Click on the picture to return to the original post. Six dynamic portrait lesson plans including full photo tutorials, original handouts, templates and student samples. Click on the photo to return to the original post. Templates, Tutorials and More! Six different lessons included.Click on the picture to read the post description. Eight page art lesson includes two drawing handouts, photo tutorial and student samples. Click on the picture to return to the original post. Nine page art lesson includes 3 "how-to-draw" handouts, photo tutorial and student samples. Click on the picture to return to the original post.